Hi friends! Today I am sharing some of my favorite outfit looks from all of my goodies from the Nordstrom Anniversary Sale. These are all looks you can wear now and on into fall. sizing: My top is actually from the sale last year but it is back again and I always size up for a larger fit. 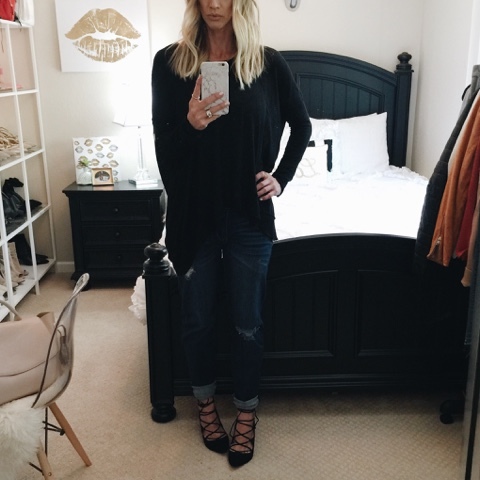 These jeans are TTS and one of my faves!! Boots are TTS and obsessed!! sizing: The cardigan is huge. I am exchanging mine for a medium it feels so big on. I am beyond in love with this top and I got a medium. Same boots as above and jeans are TTS. sizing: This dress is one of my favorite purchases from #nsale. 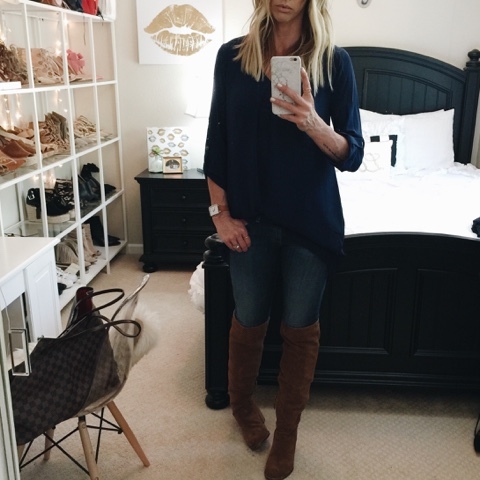 Lately I have been loving navy blue os much and this color is perfect for fall. I love that you can tuck it into your jeans and is longer in the back (see below pic) or wear it with leggings and as a dress. sizing: See above and these boots are amazing!! Not only are they from the beautiful Ivanka Trump, the are stretchy, have a piece of elastic behind knee to keep them up and a zipper to get into the comfortably. I had been on the prowl for a flat, grey, OTK boot and these nailed it.